With these great features, this keyboard is what I'm looking for (there are many better keyboards out there but this one is perfect-for me), but I won't get this keyboard , why? 10 days only of battery life, might be caused by the back light, which even though I want, I'm still willing to sacrifice it just to get more life from a single charge. The only time I need the backlit keys is when I'm watching movies (lights are out) on the PC then i need to reply to a instant message or any activity that uses the keyboard. Motion and ambient light sensor is not a necessity. $100 price tag doesn't justify the features, if people will be spending that amount of money for a computer peripheral then it should be of gaming grade or high performance. Honestly, I don't know where this keyboard is categorized, luxury? premium? high end ? mid end? performance(definitely not)? I have no idea. But remove the motion and light sensors, then make the backlight switch manual (to lengthen the battery life) just to get the price down to around $30-$40 , then I'll buy this one. FREMONT, Calif. - Aug. 18, 2010 -Logitech (SWX: LOGN) (NASDAQ: LOGI) today introduced the rechargeable Logitech® Wireless Illuminated Keyboard K800, delivering bright, precise illumination - day or night. The newest Logitech keyboard features ambient light and motion sensors, ensuring that you have the right amount of backlight when you need it, while conserving battery life when you don't. "The Wireless Illuminated Keyboard K800 is perfect for someone who values both form and function," said Denis Pavillard, vice president of product marketing for Logitech's keyboards and desktops. "The Wireless Illuminated K800 keyboard includes features that make it a standout - smart backlighting, Logitech® Unifying technology, our PerfectStroke™ key system and Logitech Incurve keys™ - and presents it all in a very stylish and sleek package that's sure to The Wireless Illuminated K800 backlighting automatically adjusts based on the amount of light in the room using ambient light sensors. Motion sensors detect your hands as they approach to turn the backlighting on and to turn it back off when your hands move away. As a result, you'll enjoy bright, precise illumination and more battery life - up to 10 days of battery life without recharging. (Actual battery life will vary with use, settings and environmental The Wireless Illuminated K800 is always ready when you need it thanks to the micro-USB cable that lets you recharge while you type. Due to the fast, flexible recharging, you'll never need to replace the batteries. Instead, you can simply plug in the universal micro-USB cable to recharge the onboard batteries. Because a good keyboard needs to deliver a good typing experience, the Logitech Wireless Illuminated keyboard includes the PerfectStroke™ key system and Logitech Incurve keys™. Logitech Unveils Wireless Illuminated Keyboard The PerfectStroke key system helps make every stroke comfortable, fluid and whisper-quiet. And the concave design and softly rounded edges of the durable Logitech Incurve keys position your fingers properly and invite your fingertips to glide from key to key, hour after hour. Additionally, the letters and characters on the keys are very durable and won't wear off. The Wireless Illuminated Keyboard K800 is also the latest in a line of Logitech® Unifying-compatible mice and keyboards that feature the tiny, leave-in receiver - so small you can leave it in your laptop. Unifying-compatible keyboards feature Logitech® Advanced 2.4 GHz wireless connectivity, virtually eliminating delays and dropouts. 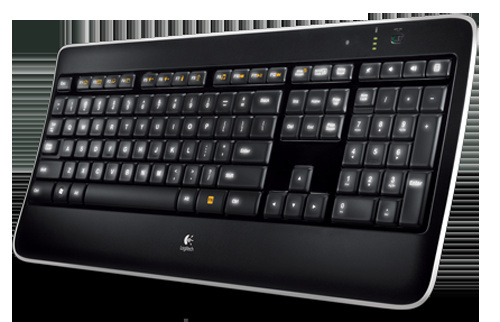 The Logitech Wireless Illuminated Keyboard K800 is expected to be available in August for a suggested retail price of $99.99 (U.S.). 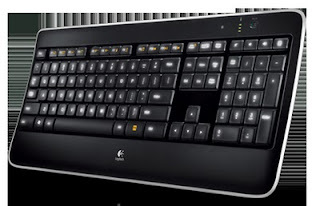 You can learn more about the Wireless Illuminated Keyboard K800 on our blog or you can visit www.logitech.com.